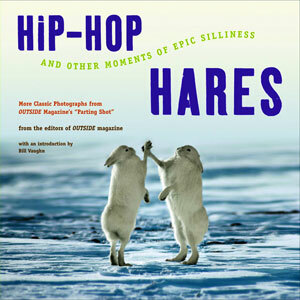 Hip-Hop Hares - Description | W. W. Norton & Company Ltd. The most hilarious, whimsical, shocking moments ever captured on film, from the editors of Outside magazine. Brace yourself for more take-your-breath-away images from Outside's famed, back-page "Parting Shot" photo feature. Each of these seventy-one shots will surprise you, wow you, and make you chuckle if you don't laugh out loud. 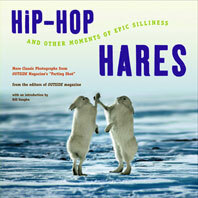 Hip-Hop Hares brings you more of what you loved in The Polar Bear Waltz. It's another zany, eye-popping collection that celebrates the pratfalls and bizarre coincidences of outdoor life—the comic circumstances of relatively tame mammals (us) spending more and more time closer and closer to wild animals. It's a rare chance to look into the wide world outside and laugh at both ourselves and that infinitely wondrous, entertaining, three-ring circus we call the universe. The most hilarious, whimsical moments captured on film, from twenty-five years of living Outside.